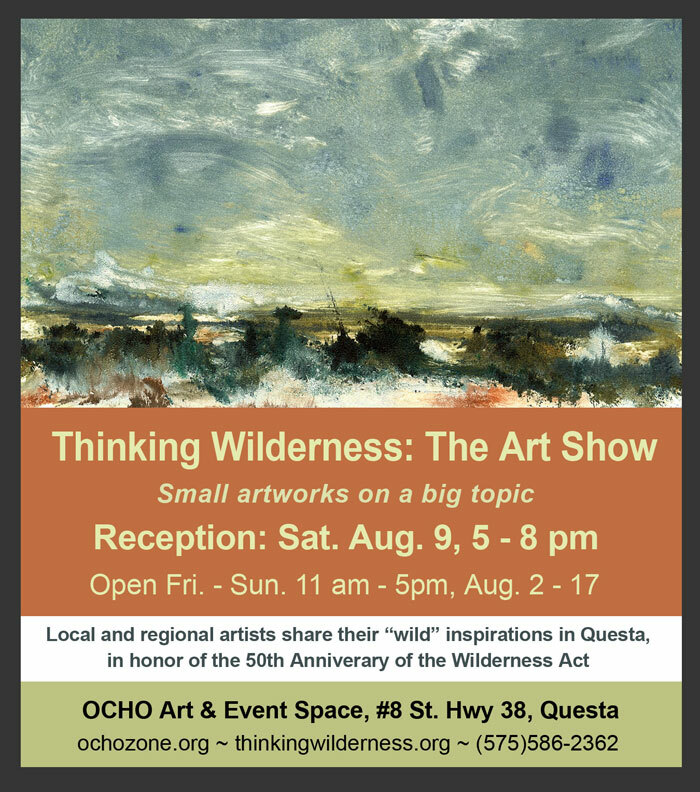 A reception for “wild” art in Questa! LEAP’s “Thinking Wilderness” event series turns its attention, this month, to the visual arts! Throughout history, artists have played an important role in defining our relationship with nature and “wilderness.”  Prior to the 1800’s, most Western art was of religious scenes, allegory, or portraiture. Artists such as painters J. M. W. Turner and John Constable in Great Britain, began to rearrange the entire value system of Western culture, adding an element of awe and reverence for the inherent value of nature. In the United States, the work of nineteenth-century painters such as Albert Beirstadt, and Thomas Moran, inspired pride in America’s wild landscapes and an interest in preserving them. Many artists today continue to build an appreciation for wilderness, offering emotional insights into the legacy of stewardship that is so important to the very self-image of Americans, and certainly to those of us in New Mexico. “Thinking Wilderness: The Art Show” shines a spotlight on this continuing legacy. Hosted and curated by nonprofit LEAP (Land, Experience and Art of Place) and OCHO Art & Event Space, “Thinking Wilderness: The Art Show” features works by over 25 local and regional artists in a variety of two and three dimensional mediums. The show continues Questa’s participation in the nationwide marking of the 50th anniversary of the Wilderness Act, which now protects over 100 million acres of land. Questa itself is surrounded by some of the most beautiful protected lands in the U.S. The show includes small works by photographers Phil Gruiss and René Janiece, beaded hummingbird sculptures by Audrey Kunkel, a barnwood-framed pastel by Beatrice Miera-Medina, oil on canvas by Robert Perez jr., a bold watercolor abstract by Martha Shepp, Mimbres-inspired ink on paper by Starr, exquisite small collage by Katherine Elmore, textured ceramics by Roderick Oknich, woodblock prints by Christa Marquez, and much more; a wonderful sampling of Northern New Mexico talent! “We’ve hung some wonderful shows in the past, but the Thinking Wilderness show is one of the most interesting group shows yet,” says OCHO’s Barrie Andrews. A public reception will be held on Saturday, August 9, from 5 – 8 pm. Hors d’oeuvres, drinks and music (by Bittersweet Highway, and Michael Rael) will add to the celebration. People’s Choice Awards will be announced at the end of the evening. The “Thinking Wilderness” event series organized by LEAP will continue with the annual NeoRio event at Wild Rivers in the Rio Grande del Norte National Monument on September 6th. This year will feature nationally-known UNM Professor of art, environment, and technology, Andrea Polli. A unique on-line residency will finish out the 50th anniversary year with local as well as national and even international “thinkers,” each with a week-long platform to share their thoughts, their work, and move the dialog forward for each of us to consider what wilderness means to us. Remote wild lands have informed Questa’s history, and wilderness traditions continue unbroken in many ways. Plus this area is Taos County’s best kept secret for dramatic hikes and serene camping. Chevron mine or no Chevron mine, they can’t take this away from this dynamic little village. For more information on “Thinking Wilderness: The Art Show” or to participate in the online residency project go to: http://www.thinkingwilderness.org or call Claire, 575-586-2362. This entry was posted in Uncategorized and tagged Art Show, LEAP, OCHO, Questa, Thinking Wilderness on August 3, 2014 by Thinking Wilderness.